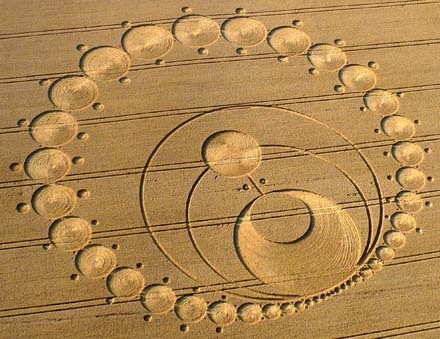 "We are now witnessing the most exciting and promising crop circles ever to be seen on our planet... "
As had been anticipated, the most recent additions to the crop circle collection from the farm fields of southern England during the Summer of 2010 continue to strongly signal that a new Earth is rapidly unfolding for humanity. In our previous news article, we examined five significant crop circles formed since the month of May and winding through July, that were clearly indicating this new Earth scenario is accelerating into high gear. Now for the month of August the circle makers have produced two additional noteworthy formations that appear to be offering further proof of the new Earth chain of events are continuing to progress for all the world to witness. The new Earth prophecy has been proposed by many but most particularly by prominent authors and researchers such as Dolores Cannon, David Wilcock, Eckhart Tolle and many others, and can even be found within the pages of the Bible. The prophecy calls for a new more highly evolved Earth emerging from our present day Earth that will resonate at a greater frequency, specifically in the 5th dimension, thereby, fulfilling the prophecy of the Heaven on Earth, or the Golden Age that has been long anticipated for centuries. The process by which the new Earth will be born will be similar to that of two cells dividing, which in scientific terms is referred to as mitosis. As this new Earth resonates at a higher frequency and splits from the old, it eventually will become the new home for nearly all of the human race. A small portion of human beings who continue to resonate with the negative frequencies and lower vibrations will stay with the present day Earth and thus, will be unable to assimilate to the new Earth. According to information uncovered by Dolores Cannon, it has become necessary to create a new Earth due to eons and eons of accumulated karma that has trapped much of the human population in an endless cycle of what the Buddhist tradition calls "the wheel of life". In other words –– birth, life and death and rebirth, over and over again without evolution of the soul. However, all that is about to dramatically change beginning possibly as early as the year 2012, or shortly thereafter. These two new crop circles, along with another Mayan calendar themed circle, are providing the most substantial evidence yet that a new 5th dimensional Earth is unfolding in the most spectacular fashion imaginable! The first noteworthy new crop circle appeared in Pewsey White Horse, near Pewsey, Wiltshire and was reported on August 8, 2010. This formation featured an astoundingly complex series of circles that number over forty-four with a single line connecting two of the larger circles together. From this formation, it appears as if a new circle is being pulled from the larger circle at the bottom of this formation. Almost as if a new heavenly body –– the new Earth –– is being born from the womb of the old Earth, so to speak. If our conclusions are correct, we can then speculate that the other circles in the pattern are representing the spiritual and physical metamorphosis that the human body is undergoing at this time. Around the larger of the two circles (the old Earth) are seen two large rings while the entire formation is framed by a series of forty smaller circles that increase in size from the bottom to the top of the formation. In addition, each of these circles contains two tiny satellite circles surrounding them, or, perhaps orbiting them. Could these forty smaller circles be representative of the atomic structure of the human body featuring the nucleus and surrounding electrons? A physical human body can be transformed into a light body by raising energy and consciousness, thereby, causing the electrons around the nucleus of the atoms to spin at faster and faster rates, eventually reaching the speed of light. Theoretically, when that point is reached, one has achieved the light body activation. 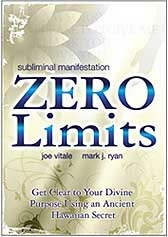 Although this is not to suggest that all of humanity will be transforming into light beings upon the new Earth, but rather, this is to illustrate part of the natural evolution that some people may attain at some point in the future. This process is commonly known as ascension. 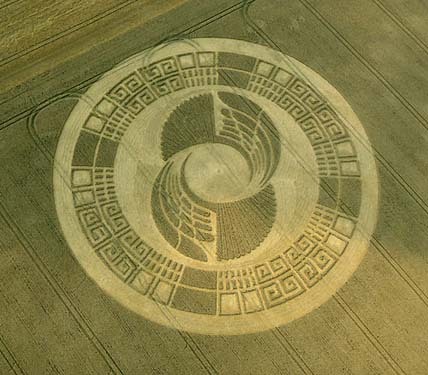 The second new crop circle worth mentioning was found in Northdowns, near Beckhampton, Wiltshire and was reported on August 13, 2010. This formation appears to be the classic "holy grail" depiction of the golden chalice, or cup, featuring a long stem to the base. Within the cup we find another circle resting, (or perhaps nesting) as if ready to be poured, dropped, or, perhaps birthed from the cup. The cup may be another symbol for the womb. The Holy Grail legend of course, has been much debated over the years since it was to have originated during the Last Supper with Jesus of Nazareth and his his twelve Apostles (as painted by Leonardo Da Vinci), then further enhanced during the days of the Knights Templar and the Knights of the Round Table. Many believe the holy grail to be an actual cup or chalice, while others have interpreted the legend in an entirely different manner altogether. It is interesting to note that if we examine the holy grail legend in its most recent incarnation –– that being the very popular book by Dan Brown, "The Da Vinci Code", and the subsequent film adaption starring Tom Hanks from 2008 –– we find the most startling, yet controversial interpretation. Both book and film were based around yet another book entitled, "Holy Blood, Holy Grail" by Michael Baigent, Richard Leigh and Henry Lincoln, first published in 1982. The plot line for both books and the film centered around a series of clues that indicated it was entirely likely that Jesus and Mary Magdalene were married and together bore children, contrary to most Christian religious teachings and most particularly, the principles of the Catholic Church. The holy grail, it was speculated, was not only the secrets surrounding the marriage of Jesus and Mary Magdalene, but also the fact that they had produced heirs, and thus a bloodline that could be traced through to modern times. The marriage of Jesus and Mary Magdalene was further examined in the documentary film, “Bloodline,” which put even more of the spotlight upon the actual pregnancy of Mary Magdalene to be the true holy grail. The filmmakers went to great lengths to search for clues at the Mary Magdalene Church and the surrounding areas in Rennes-le-Chateau, France, where it has been reported that a series of documents and artifacts were discovered by the priest, François Bérenger Sauniére, confirming this sacred marriage of Jesus and Mary Magdalene. 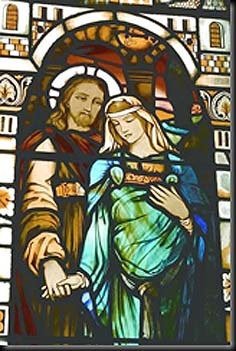 The film also pointed to a special stained glass window (pictured right) found in Kilmore Church on the Isle of Mull in Scotland, which seemed to clearly portray a betrothed and pregnant Mary Magdalene. In Rennes-le-Chateau, Father Sauniére was believed to have left behind many other indelible clues which offered supporting evidence to be uncovered long after his death, so as not to raise the ire of the Vatican. Still others suggest the holy grail is the secret and sacred knowledge that was discovered by the Knights Templar in Solomon's Temple in Jerusalem, which is now known as the Temple Mount, or Dome of the Rock. The Knights Templar spent up to thirteen years scouring and digging through the temple to uncover a set of a sacred documents that taught them their greatest secrets, which made them rich and powerful for centuries to come. Obviously, the enormity of the holy grail legend is one that can be debated and speculated upon endlessly, but nonetheless, it is interesting that this particular crop circle from Northdowns would appear to be clearly referencing something about the myth. 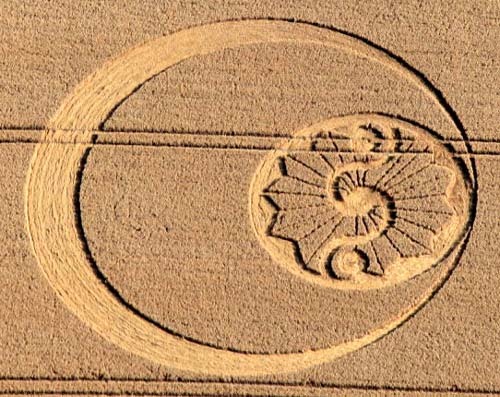 So in essence, this amazing crop circle could be clueing us in to the fact that the holy grail is the birth of the new Earth which will contain all the greatest secrets of cosmic knowledge, wisdom, consciousness, evolution, ascension, etc. –– the greatest gift ever prepared for humanity –– thus incorporating two holy grail theories in one! And finally, as if that was not enough, we find yet another notable crop circle, and although it does not directly imply the new Earth, nonetheless, offers very prophetic implications. This circle was found on Stanton Bridge, near Honey Street, Wiltshire. Reported on August 8, 2010 and is nearly an exact depiction of the Tzolk'in calendar, which is one of the twenty different Mayan calendars known to exist. The Tzolk'in is also referred to as the sacred, personal, or astrological calendar. In the Mayan language, Tzolk'in means, "count of days," and this calendar is 260 days long and is used as the personal calendar of the Maya and to plot out astrological projections, to chart agricultural seasonal planting and to determine sacred divination. The Tzolk'in calendar consisted of thirteen intentions on the part of Creation, as represented by the smaller inner wheel, and twenty aspects on the part of Creation, as represented by the larger outer wheel (13 x 20 = 260). These two elements of the Tzolk'in calendar created cycles and were coordinated together by interlocking teeth or gears which visually bears an uncanny resemblance to the crop circle from Stanton Bridge, as is clearly seen above and below. Obviously, the circle makers want us to pay close attention to the Mayan prophecies which strongly suggest that humanity is about to make a great leap forward in consciousness and evolution beginning in the year 2011 and into 2012. Mayan themes have been appearing with increasing regularity among crop circle formations and they were particularly prominent throughout the entire year of 2009. 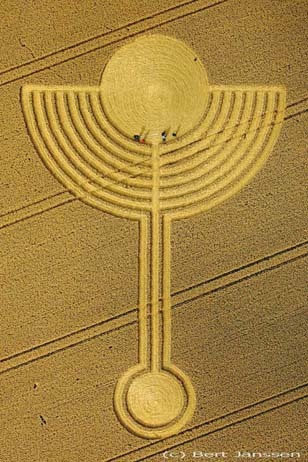 At least six different crop circles in 2009 had Mayan-oriented imagery or themes, although very few have been seen thus far in 2010. Yet the Stanton Bridge circle from August 8th is perhaps one of the most strikingly Mayan themed circles in at least six years. Easily the most pronounced Mayan calendar themed formation ever to appear was found in 2004 in Silbury Hill, near Beckhampton, Wiltshire on August 2nd of that year. it was one of the most complex formations ever seen and in fact, the circle makers returned the following day to add even more intricate features to it's stunning design from the previous day. There yet remains another month in the crop circle season and we are most likely to expect to see more formations foretelling wonderful news for humanity's imminent future. Although admittedly open to many interpretations, crop circles offer some of the most direct and timely messages from extra-terrestrials and higher dimensional beings to be found on Earth, despite what the debunkers want to tell you. Their intent is to awaken within the human DNA long forgotten memories of our spiritual and extra-terrestrial heritage and to trigger a rising of consciousness and thus –– the movement to the new Earth. We are now witnessing the most exciting and promising crop circles ever to be seen on our planet and they are only going to appear with more and more profound meanings and symbolism. The extra-terrestrials and spiritual realms are posting these messages like headlines in a global newspaper or billboards across the highways of the world. Allow these incredible sacred geometrical patterns found within the crop circles to resonate within your heart and begin to feel the great excitement that is building upon the Earth. It is becoming palpable in so many, many ways now. Expect great miracles to unfold for your own personal evolution beginning right now. We are so close now, can you feel it? Can you? Two beautiful Crop Circles 8th Aug 2010 at Pewsey White Horse and Stanton Bridge, Wiltshire, UK!